Add melted butter and vanilla essence, mix well. Press into an oblong microwave baking pan, and bake on full power for 3.5 minutes**. 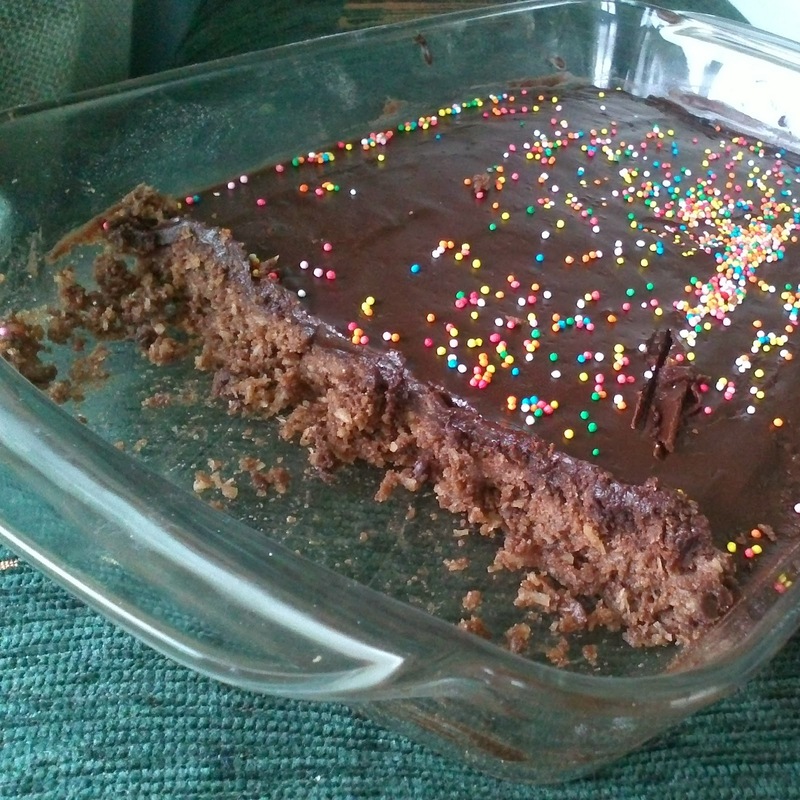 Spread with chocolate icing***, and return to the microwave for a further 30 seconds for a fudgy effect to the icing. Instead of using regular icing - sprinkle chocolate balls / buttons thickly over the top and allow to melt before spreading with a knife to cover. If you run out of coconut, you can used flaked rice for a crunchier substitute; or half in half. Reduce the cocoa by half and add 1/2tbsp of orange drink powder for a jaffa effect. I was given a photocopy of this recipe from a friend of mine, her's was also a photocopy... so where this has come from is anyone's guess! But it is GOOD! Leonie - here is the link to that G-F Peppermint Slice I was telling you about; surprisingly the base is almost exactly the same as the recipe above! *** the above highlighted link also gives you the recipe for the chocolate icing that I used on this slice. Amy - I think you'll like this slice also! Popped over to visit hubby's sister the other day, and took some with me - her and our nieces LOVED it; my biggest compliment! You could also include peppermint essence with the chocolate icing, and turn it into an even quicker and easier peppermint slice... or would that be fatal!!!!!!????? Hmmm - I may be tempted by this one - cheap to make, lots of variations and no oven......... ticks all the right boxes. You are a baking machine! Time to host a bloggy get together at your house?